GeSWall (GentleSecurityWall) is a useful firewall designed to help you to surf the web, open e-mail attachments, chat, exchange files etc, regardless of the security threats posed by the internet. 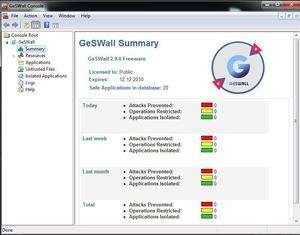 GeSWall isolates applications that may serve as entry points for malicious software and targeted intrusions. Isolation applies access restrictions that effectively prevent damage. For security reasons, you should also check out the GeSWall download at LO4D.com which includes virus and malware tests. Additional screenshots of this application download may be available, too.